The symphony was composed in one month in the summer of 1944 at the Soviet Composers’ Union dacha in Ivanovo, east of Moscow. Composers went there to work in peace and serenity and when Prokofiev arrived Glière, Shostakovich, Kabalesvsky, Khachaturian and others were already in residence. While they seemed content to enjoy the bucolic retreat, Prokofiev followed a strict regime for meals, walks, exercise and work. He always went to his studio at ten and worked through the day. In the evening he insisted that everyone share what they had accomplished that day. No doubt his early departure to orchestrate the symphony back in Moscow came as a relief to his colleagues. When did it have it first performance? Prokofiev conducted the USSR State Symphony Orchestra at the premiere on January 13, 1945 in the Great Hall at the Moscow Conservatory. It was well received and became one of his most popular works. It was to be the last time he conducted in public. Three weeks later he had a mild heart attack, fell down the stairs in his apartment and suffered a slight concussion that was to affect him for the remaining years of his life. The Boston Symphony Orchestra under Serge Koussevitzky introduced it to the West in November of that same year. What instruments does the composer use? Depending on the conductor, between 40 to 45 minutes. What did Prokofiev have to say about the work? Before the premiere he stated that the Symphony was intended as “a hymn to free and happy Mankind, to his might powers, his pure and noble spirit.” And he went on to muse, “I cannot say that I deliberately chose this theme. It was born in me and clamoured for expression. The music matured within me. It filled my soul.” Though it sounds very noble it also sounds much like the sort of statement expected by the State officials of a good “Soviet” composer. In light of those words the dark edge that is the subtext to the piece has often been ignored. Yes it is at times joyful, and hopeful but the same ironic subversity that is apparent in many of his scores lies just below the surface. There is laughter and joy in that final movement but it is brittle laughter and the joy is forced. What was happening in Russia at the time? The War had taken a turn and the Soviet armies were experiencing victory in the Vistula-Oder Campaign. Just before Prokofiev lifted his baton to conduct the premiere word had reached Moscow that the Vistula had been crossed and the Nazi army driven out of Warsaw. There was an air of optimism in both official and public circles and music was meant to uplift and celebrate the victory of the Soviet way of life. What form does the symphony take? After Dmitri Shostakovich had demonstrated that he had seen and corrected “the error of his ways” in his Fifth Symphony it became the standard form for a “true” Soviet Symphony. Prokofiev followed the formula: a dignified opening movement, followed by a scherzo, then a slow lamentation, ending in a triumphant finale. Many of the themes had been composed over the previous ten years: the scherzo is based on a rejected dance from Romeo and Juliet and the lyric passage from the third movement from a discarded film score from an aborted version of The Queen of Spades. Are there recordings available of the work? The No. 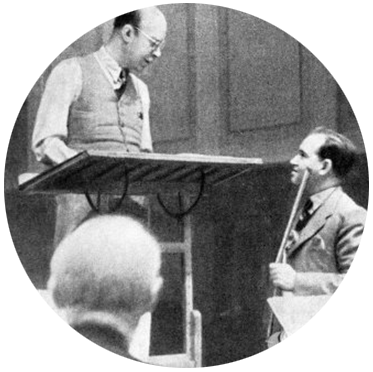 5 was recorded a year after it’s premiere by Koussevitzky and the BSO and released on five 78-rpm discs by RCA Victor. Seventy-odd years later it is still in the catalogue and available as a digital download. Every major orchestra and conductor has recorded it at least once if not in some cases two or three times. One music website lists 117 recordings of studio or live performances currently available! Where can I get a sample of the work? There are several versions available on YouTube including a 2013 broadcast at the BBC Proms with Canadian conductor Yannick Nézet-Séguin and his Rotterdam Philharmonic.